First, using a laser while doing dry fire practice at home will provide absolute feedback on the quality of your trigger presses. If you move the gun while pressing the trigger, even just a little, the laser on your (safe backstop!) dry fire target will visibly move. Tiny movements that might not be visible if you're looking at the front sight will be amplified on that laser dot across the room. When you can press the trigger smoothly every time while maintaining a steady laser dot on your target, you’re getting good. In low light, even a glowing night sight needs to be aligned with the target. By eliminating the need to line up two different things in two different sight planes (the front sight and the target), the laser speeds aiming in the dark. Put the dot on the target - that’s all there is to it. We humans and most other critters have built-in defense mechanisms that have protected us from dangerous things for thousands and thousands of years. These instincts are very well developed and therefore very hard to override. One of those survival instincts is that we will tend to focus on the threat to us, even to the point of excluding auditory input and developing tunnel vision on that threat. Finding and focusing on the front sight requires some serious effort under the worst conditions imaginable - consciously moving our focus from the threat to the sights is not a natural thing to do. Yes, training will help overcome this tendency. Use of a laser supports your instinct to focus on the threat. When you activate the laser, while looking at the threat, you will literally see your “sight” (laser beam) on the target itself. I think of this one as sailing downwind rather than head on into it. The conventional shooting position has your gun mounted up high, right in front of your line of sight so you can obtain a good sight picture. The problem is, during a defensive gun use, you may not have the option of assuming a proper shooting stance. For example, if you are moving, you may find you are carrying your handgun low, so it’s not obscuring your vision. 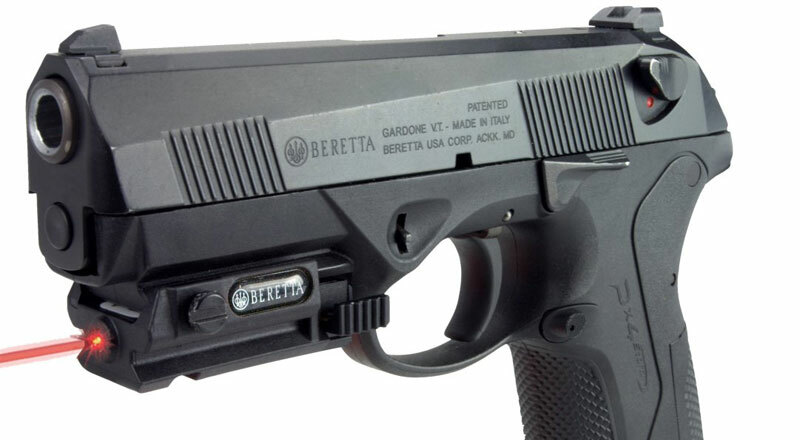 Should you need to shoot, you'll have to raise the gun to take advantage of conventional iron sights. With a laser, you can aim and shoot directly from the low-ready position. In numerous shoot house training scenarios, I’ve found myself moving and searching with my gun held low so I can see where I’m going and look for threats. The laser makes all the difference in these situations. If you end up on the ground, either on your back, side or stomach, it's a heck of a lot easier to aim with the laser than trying align sights from an awkward position. If you don't believe me, try it. Speaking of unconventional shooting positions, use of a laser allows you to aim and shoot effectively around barriers without having to build a traditional firing stance. During a cave shooting exercise at Rock Castle Shooting Center, I found myself able to engage targets more quickly when coming around corners. The laser beam offered an additional indicator that my line of fire was clear of corner barriers. I found that the use of a laser in this type of very dark environment, filled with obstacles, was incredibly fast. More importantly, I was fully confident of my shots before I pulled the trigger. Depending on whose numbers you consider, law enforcement shootings have only a 20-25% hit rate. Think about that. Somewhere over 75% of shots miss their target. There are plenty of reasons for this. Stress, natural loss of fine motor control, and low-light conditions top the list. According to laser manufacturer Crimson Trace, law enforcement agencies that have adopted lasers have experienced hit rates approaching 90%. That’s quite a difference. When you consider the first four benefits we’ve discussed here, the dramatic improvement makes a lot of sense. None of this is intended to suggest that you don't learn to shoot, and continue to practice with, iron sights. Think of lasers as an additional enhancement for certain situations. When it comes to defending yourself, you want to use every possible advantage. Next time, we’ll look at the flip side and talk about some of the myths and misconceptions related to handgun laser use.